During the 2018 McWhorter Society Luncheon held at Belmont University last month, The Honorable Winfield C. Dunn was presented with the Distinguished Service Award, and the seven inductees into the Tennessee Health Care Hall of Fame Class of 2018 were announced. McWhorter Society Chair Bill Gracey and Past Chair Harry Jacobson, MD, presented Gov. 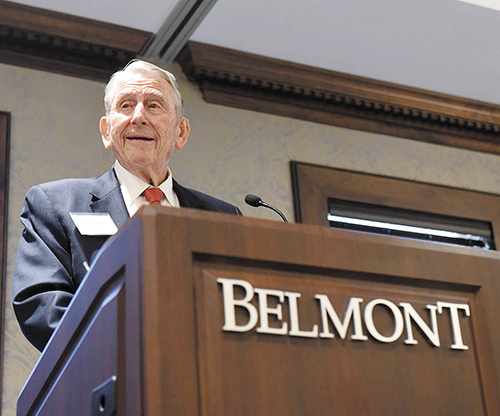 Dunn with the high honor for his lifetime of service and significant contributions to the health and healthcare-related academic programs at Belmont University, in addition to his work to improve the health of Tennesseans through his public service and advocacy. The nonagenarian, who earned his dental degree from the University of Tennessee College of Dentistry in 1955, also spent several years working as an executive with Hospital Corporation of America and later with Memphis-based MedShares. He and his wife, Betty, have been previously honored for their hands-on work with the Nashville Heart Association, and the Dunns have also worked tirelessly for the Nashville chapter of the American Cancer Society. Dunn has served on a number of healthcare boards including Phycor, Total eMed, and Behavioral Healthcare Corporation. He is the sixth individual to receive the McWhorter Society Distinguished Service Award. Monroe Carell, Jr.: The former CEO of Nashville-based Central Parking Corporation and prominent philanthropist led efforts to fund the Monroe Carell, Jr. Children's Hospital at Vanderbilt. Carol Etherington, MSN, RN, FAAN: The chair of the Metro Nashville Board of Health is well known for her work advocating on behalf of those in need including initiating the Victim Intervention for the Davidson County Police Department, establishing coalitions that led to the founding of the Nashville Prevention Partnership, volunteering medical services across the globe and serving as associate professor emerita of Nursing at Vanderbilt Institute for Global Health. John Henry Hale, MD, & Millie Hale, RN: The brave and innovative practitioners paved the way for healthcare justice and equality by opening their home to become the Millie E. Hale Hospital when African Americans couldn't be treated at 'white' institutions. The dynamic duo also created a holistic community center. In addition, Dr. Hale was professor of Clinical Medicine and Surgery at Meharry, and Millie Hale created a training center for nurses across the South. Lynn Massingale, MD: The founder and chairman of TeamHealth, one of the largest integrated care providers in the country, is widely hailed as a major influencer on emergency medicine nationwide. He has been previously recognized as a 'Hero of Emergency Medicine' by the American College of Emergency Physicians and as one of the Modern Healthcare's "Top 100 Most Influential People in Healthcare." William Schaffner, MD: The professor of Preventive Medicine in the Department of Health Policy and professor of Medicine in the Division of Infectious Diseases at Vanderbilt University School of Medicine is one of the nation's pioneers of rigorous infection control in hospitals. His Nashville standard became the standard of excellence nationwide. He is widely seen as a national leader on adult immunizations and is the longest serving member of the CDC's Advisory Committee on Immunization Practices. Matthew Walker, Sr., MD, FACS: Founder of the Matthew Walker Comprehensive Health Center, which is celebrating its golden anniversary in 2018, Walker was one of the first African Americans voted into the Nashville Academy of Medicine and became the first African American Fellow of the American College of Surgeons. Serving as a professor at Meharry for four decades, he was credited with training half of the African American physicians in the United States at the time of his death. The induction ceremony for this latest class of luminaries is set for Oct. 16 at Belmont University.